Omoyeni-disu.blogspot.com: YOU HAVE GOT TO BE KIDDING ME. PDP isnt taking thing easy oh! 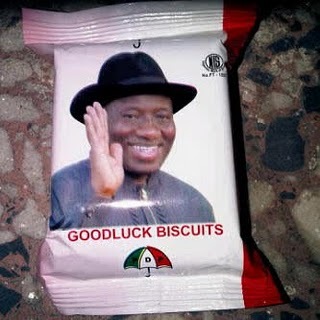 now we have Goodluck bisuits,let the man be producing biscuit and sweet everywhere,but to debate is a problem and the excuse is that they are busy with campaign#na so. you might not like it but this is 9ja. this sort of funny idea works. sorry....it does. let me see who is going to stop the pdp from winning...?